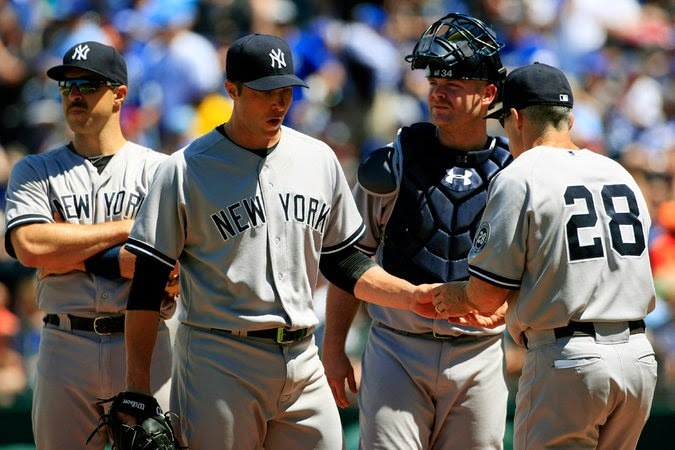 Yankees struggling (recaps), what's next? Well Yankees fans, it’s been a while since we’ve written and the team has been slumping to say the least dropping 5 of their last 7 games. Clearly, something has to give, so the team is likely to shave their mustaches, thus, no longer being the #stachesquad and we will write more in hope of reversing the team’s play. We’ll briefly take you through the team’s last 7 games and give you a brief write up of what is coming up for the Yanks. The bats were alive for the team as they opened up the 4-game set with the Rays just as they would have hoped. The Yankees slugged 5 home runs off the bats of Alex Rodriguez (solo), Chase Headley (3-run), Carlos Beltran (solo), Brett Gardner (3-run), and Mark Teixeira (2-run). Every Yankee in the starting lineup was able to get a hit except Didi Gregorius who went 0-3. Mark Teixiera had to be the stand out of the game going 4-5 with a HR, 2B and 2 singles as he was a triple away from the cycle. CC Sabathia put together a quality start grabbing his first win of the season in a game where he had really good stuff. Although Sabathia gave up 3 runs in the 7th, his final line was 7 IP, 6 H, 4 R (3 ER), 2 BB and 9 K’s. The highlight of the game just might have come on the last out where Brett Gardner went back to catch a fly ball that went off the catwalk (resulting in an automatic out) only to be caught by Didi Gregorius. It was a pinball ending to a great game by the Yankees. The Yankees were unable to keep momentum on their side following their offense outburst in game one as the team struggled only scoring 2 runs, both in the first inning in game two. Ellsbury and Gardner both picked up 2 hits while Brian McCann and Beltran both knocked RBI singles. Nathan Eovaldi had what was likely his best stuff of the season up until his 8th inning of work. After going through 6 shutout innings, Eovaldi allowed 2 runs in both the 7th and 8th innings which was all Tampa Bay needed. Eovaldi left with a final line of 7.1 IP, 6 H, 4 R (all earned), 2 BB, and 6 K’s. It was a disappointing loss to a game that had promise early combined with the great outing from Nasty Nate. In a similar fashion to game 2 of the series, the Yankees struck first in game three grabbing 2 early runs in the 1st inning. Teixiera and McCann were both able to go 2-4 with RBI singles from both of them, but the team failed to get an extra base hit all game during games two and three. It appeared as though the Yankees had used up all of their offense for the series during their 5 home run outburst in the series opener. 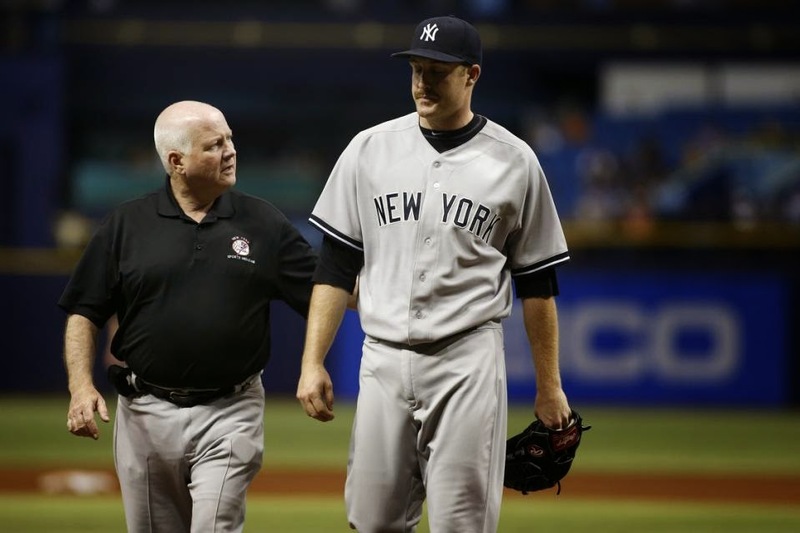 Adam Warren pitched well going 7 innings allow 7 hits, 3 ER, 1 walk and 7 strikeouts. Andrew Miller struck out the side in the 8th but the Yankees were unable to get any kind of rhythm on the offensive side. In contrast to games two and three, the Yankees were unable to manage any offense whatsoever until the 9th inning of game three. The Yankees went through all of games two and three and all the way until the 9th inning of game four without getting an extra base hit. 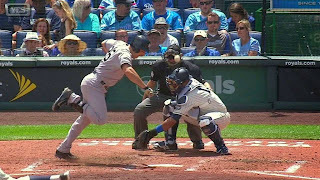 Alex Rodriguez launched a home run to put the Yankees on the board in a game that was no fun to watch in the slightest. Ellsbury and A-Rod picked up 2 hits and Brett Gardner picked up 1 as the top 3 hitters were the only ones who didn’t look lost at the plate. The real story of this game was the injury to Chase Whitley in a start where he didn’t look sharp. Whitley was pulled in the 2nd inning after allowing 2 hits and one earned before Esmil Rogers gave up a 3-run blast tagging Whitley with three total earned runs in 1.2 innings. The injury is in the UCL area as it was initially diagnosed as a torn UCL with Tommy John Surgery on the leger. However, the diagnosis has since been changed to a strained elbow as Whitley finds himself on the 15-day DL with TJS still a possibility. After the game Whitley told Meredith Marakovits that he’s been feeling the injury for a while but “adrenaline would take over.” He went on to say that he had been feeling “pain on the pitch” for a few starts and that it took over and was a constant pain during his short outing against the Rays. He is hopeful to avoid the surgery, and that is in his and the fan’s best interests. This was a game that even as a die-hard Yankee fan, I could not sit through and watch the whole thing. The series opening with the best team in the American League was probably the Yankees worst performances as a team all season long. The game was close with New York trailing 2-1 going into the 6th inning before the team imploded. Michael Pineda allowed 3 earned runs that inning lasting just 5.1 innings allowing 10 hits, 5 earned runs, 0 walks and just 1 strikeout – a big change from his 16 strikeout Mother’s Day outing. David Carpenter faced one batter allowing an earned run before turning to Justin Wilson who recorded just one out allowing 3 hits, one walk and two earned runs. Newly called up Jose Ramirez came in for the last out of the 5th and could not get through the 7th inning as he was not good giving up 3 hits, 2 walks and 4 earned runs in 1 inning of work. Brandon Pinder continued pitching well as he recorded the last out of the 7th and pitched a scoreless 8th picking up one strikeout. I turned the game off in the 7th inning as things looked worse and worse as this was a game to forget. In a nice turnaround from game one, the Yankees were able to win pretty handily in game two. 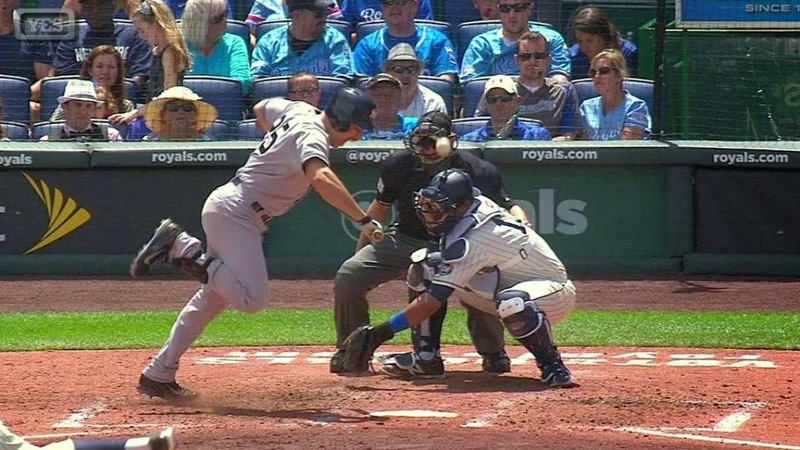 Chase Headley knocked a huge 3-run home run in the 5th inning on a 3-2-2 pitch from Royals starter Danny Duffy. That moved the Yankees to a 4-1 lead which stood steady until an A-Bomb, from A-Rod in the top of the 9th provided a big insurance run for the Bombers. Despite the insurance run, Andrew Miller came on in the 9th in a non-save situation and pitched a perfect inning. CC Sabathia followed up one quality start with another getting his second win of the season going 7 innings with 6 hits allowed, 1 earned run, 0 walks and 5 strikeouts. He lowered his ERA from 5.45 to 4.67 in just two starts as he is beginning to look sharp and effective. Dellin Betances continued his dominance as him and Miller have yet to allow an earned run all season. The Yankees will have a MUCH needed off day Monday, May 18 after playing games on each of the past 17 days followed by a 2-game set with the Washington Nationals – one of the hottest teams in baseball winning 9 of their last 11 games. The key to either splitting or taking both games will be not allowing Bryce Harper to get to them. In what’s looking like a season where Harper is finally reaching his potential, there is little dispute he’s the NL MVP through the first month and a half hitting .338 with an NL leading 14 HR and 37 RBI’s. Nathan Eovaldi will have the ball in game one vs. Gio Gonzalez for the Nationals with Adam Warren going in game two where it is unclear as to who will start for the Nats. The Yankees will then have another day off May 24th before begging a 6-game home stand hosting the Texas Rangers and Kansas City Royals once again. Follow the @BronxBomberBlog on twitter for more Yankees MLB news, MiLB news, live-game tweets, satire, polls and anything else regarding the Yankees!